Numbers showing on spike abacus helps the students to understand the number and its place value. 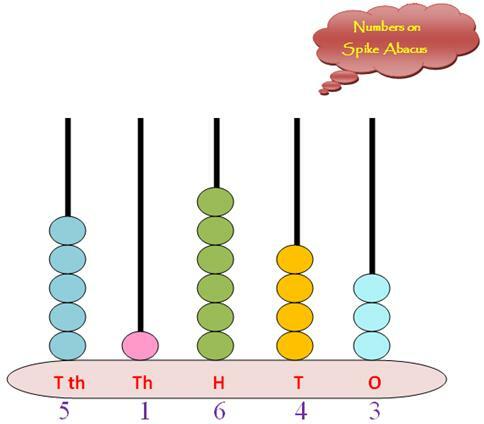 Spike abacus is very helpful to understand the concept of magnitude and name of a number. We know that the spike-abacus represents the number of multi-digits where the digits are represented by the spikes of the abacus. The spikes from right to left represent the places of the place values of the digits in increasing order i.e., 1, 10, 100, ………. etc. These places are denoted by O (unit or ones), T (tens), H (hundreds), Th (thousands), T th (ten thousands), H th (hundred thousands) and so on ……… . From the above abacus we can count the beads from right to left and then write the exact number i.e., 51643. O (unit or ones) ----- In ones or unit place we see 3 beads. T (tens) ----- In tens place we see 4 beads. H (hundreds) ----- In hundreds place we see 6 beads. Th (thousands) ----- In thousands place we see 1 bead. T th (ten thousands) ----- In ten thousands place we see 5 beads. Under this topic we will mainly learn about showing the 1 digit number on spike abacus, 2 digits number on spike abacus, 3 digits number on spike abacus, 4 digits number on spike abacus, 5 digits number on spike abacus and so on….